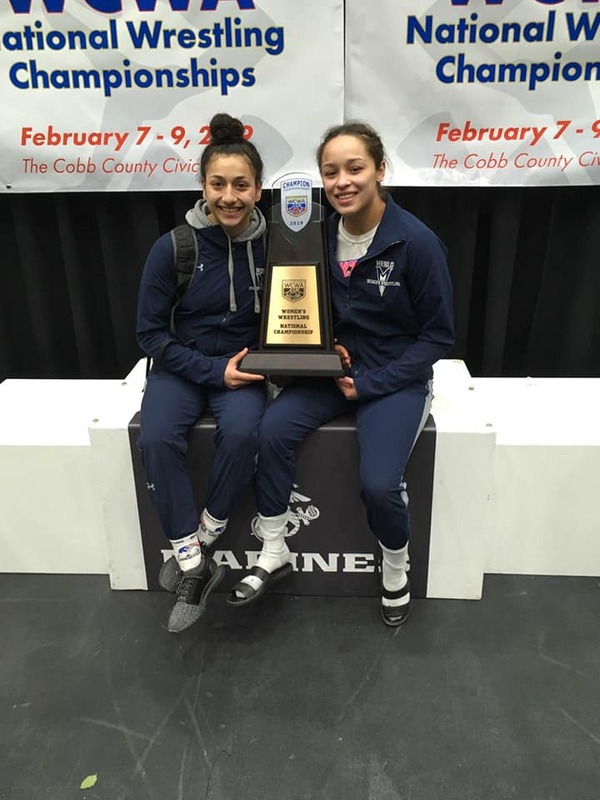 ATLANTA, GA. – The Titan Mercury Wrestling Club had a successful weekend at the Women’s Collegiate Wrestling Association (WCWA) tournament as a total of 10 of their athletes were triumphant in garnering All-American honors for their respective colleges. Four of its members claimed individual titles. Starting at 109 where freshman Alleida Martinez (Menlo College) downed McKayla Campbell of Campbellsville University via a fall in 3:59 while leading 11-0 at the time. Her Menlo College teammate Gracie Figueroa followed that up with a dominating 7-0 decision over Felicity Taylor of McKendree University, to help Menlo College clinch the team title for the first time with 199.5 points over runners-up Simon Frasier University. Freshman Jayden Laurent (Lakeland University) made history for her school by becoming the first-ever national champion in women's wrestling. Laurent, racked up a 12-1 tech fall victory over Felicity Bryant (Emmanuel College) to conclude her freshman season undefeated with a 27-0 record. Redshirt junior Alexandria Glaude (McKendree University) became a two-time All-American for the Bearcats as she captured her first-ever WCWA National Championship by a 6-2 decision win over Menlo's Iman Kazem in the 155-pound weight class. Freshman Angelina Gomez (Emmanuel College) also advance to the finals of the WCWA tournament at 101 but felt 4-2 to Asia Ray (Wayland Baptist University). As the No. 6 seed, Gomez was triumphant in knocking out the No. 3 and No. 2 seeds to advance to the finals. After giving up the initial takedown in the first period, Gomez turned things around by getting a takedown of her own in the second period after a fail headlock attempt by Ray. Nevertheless, Ray replied with a takedown of her own to seal the match and win a national title. For a second consecutive year, sophomore Alex Hendricks (Simon Frasier) advance to the finals of the national tournament and met up with teammate Dominique Parrish for the 123-pound national title. Just like last year when their bout went the full six minutes, this year was the same. After being down 7-0, Hendricks exposed Parrish back for, but her comeback came a bit too late as time ran out in the period. Sophomore Brenda Reyna (McKendree University) became an All-American for the first time as she advanced to the WCWA national finalist as the No. 2 seed at 130. Reyna pinned three of her four opponents to make the finals before falling via a 12-2 technical fall to Abby Nette (Emmanuel College) in the championship bout. Sophomore Nina Pham (Wayland Baptist University) entered the tournament as the No. 3 seed and with high hopes of becoming a national champion and an All-American once again. However, her dreams were shattered when she was upset in the quarterfinal round by eventual runner-up Angelina Gomez (Emmanuel College) 8-5. Pham rebounded back by winning three consecutive matches. Including a 10-0 technical fall over Hiba Salem of Menlo College. Alyvia Fiske (Simon Frasier) was edged out in the semis, as she lost a 9-7 decision to Iman Kazem Atherton (Menlo College). She then rebounded for a bronze medal with a 10-4 win over Hannah Gladden of Emmanuel College to conclude her sophomore season as an All-American. The last All-American for the Titan Mercury Wrestling Club was Korinahe Bullock (McKendree University). As the No. 7 seed, Bullock got a massive boost of confidence as she upset No.2 seed Stephanie Pantoja (Life University) 7-0 to advance to the semifinal round. After losing in the semifinal round to the eventual champion Dymond Guilford (Missouri Baptist University), Bullock settled for sixth place to become an All-American.